The Victrix Pro AF ANC goes all in for pro gamers, but that has it falling short in some aspects and going way too high in price. Victrix is a new competitor in the gaming headset field, and it’s coming in hard with a solidly built, pro-focused piece of kit in the Victrix Pro AF ANC. The idea behind the headset was to meet professional tournament players’ needs by using the best technology for the job. And, a lot of that technology happens to involve aircraft-grade engineering. With a commitment to superior built and features, the Victrix Pro AF ANC doesn’t avoid a high price. It’s base price is $299 (about £225, AU$400), though a pre-order discount has made it temporarily $199 (about £150, AU$265). The high price puts it in an uphill battle against some of our picks for best gaming headphones. The SteelSeries Arctis Pro (with GameDAC) comes with a high-quality build and a load of features for $249 (£249, AU$389). The Beyerdynamic Custom Game headset is also premium quality at a still lower premium price of $209 (£179, AU$249). So, while the Victrix Pro AF ANC headset offers a solid build and easy usability, its commitment to being the best eSports headset stands in the way of making it a solid recommendation for most gamers who don’t regularly play in arenas. The Victrix Pro AF ANC headset is designed for tournament gamers, and it definitely has the gamer aesthetic. It pairs a mix of matte and glossy black parts with purple accents galore (happens to perfectly match my OnePlus 5 and case). The cable is purple and shows around more of the headset, and the earcup interiors are purple. An X shape on each earcup features purple lighting, with simple options: on, off, or pulsing. The headset has a stainless steel headband with two leatherette-covered cushions. The aircraft-grade aluminum yolks slide through diecast housings that allows them extend to a desired length and also swivel about 90 degrees to lay the headset flat around your neck. The yolks don’t tuck away when they’re not extended, which gives them a curiously Batman-like look. The earcups are made of a glossy black plastic that doesn’t lend itself to the rest of the premium feel. The soft, leatherette-covered memory foam earpads are comfy and roomy. Strong magnets hold the earpads in place, but make them easy to remove as needed. Altogether the headset feels great to wear, without too much weight or pressure in any one spot. The metal used in the headset feels strong, and offers plenty of flex, but a plastic bit that allows the yolks to slide and swivels feels like a weak point. A key feature of the Victrix Pro AF ANC is the lever on each earcup that opens up a ventilation gap, so gamers ears can breathe and cool off. It’s a simple mechanism and works effectively. A clever trick is that opening the earcups automatically suspends active noise-cancelling, helping save some battery. The microphone is dazzlingly flexible, with a soft rubber coating over the metal arm. It has a pop/hiss filter at the end, and a noise shield with space for custom logos. The microphone and audio cable connect to the headset with an unfortunately large connector. 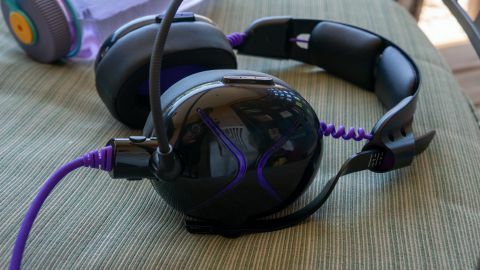 The Victrix Pro AF ANC comes with an in-line control unit, but since the headset aims to follow tournament rules and connects to computers and consoles via a 3.5mm jack, that control unit is battery powered. In other words, it’s heavy and clunky, and easy to accidentally leave on (though the headset’s basic feature still work without power). It’s also awkward with both the in and out cables stemming from the same side. Lastly, the OLED screen on it falls on the dim side, making it harder to see in bright settings. Let’s start with the good: the microphone. The 6mm bi-directional noise-cancelling mic is based on the design used in the Cobra attack helicopter, and it cleanly presents our voice. The ability to monitor the mic and adjust the gain using the in-line controls is handy (though the mic monitor sounds a tad echoey). Our teammates said we sounded weird at first, but when we recorded a sample, it was apparent that they just weren’t used to how we really sound. The rest is a bit of a mixed bag. When gaming, the audio is generally clear, and the soundstage open enough to pick up which direction sounds are coming from. While we could use this to our advantage and handily win deathmatch in Overwatch, something about the EQ balance seemed to make gunshots and footsteps in Fortnite sound further away than they actually were. Switch to PUBG, and the problem went away. Listening to music, we can really sense the different EQ settings. Naturally, the headset is high on the bass and weakens in the mids. The in-line controls provide two EQ settings, one balanced the low, mid, and high, while the other is pretty much the headsets default. Unfortunately, the bass feels too soft when using the balanced setting, but otherwise it drowns out the mids and highs. The active noise-cancelling (ANC), though effective at blocking out droning background noises, curiously seems to cut out mostly bass tones. The noise-canceling feature would also still let some higher frequency noises come through. We tried it out on a balcony with cars driving by, and most of the sound was cut down, but it sometimes leaves us feeling like our ears need to pop. The Victrix Pro AF ANC is a well-built, tournament gamer-focused headset. But, that commitment to gamers in tournament situations has meant a high price for features that won’t offer as much value to gamers everywhere else, and an aesthetic that’s only a fit for gaming. There are cheaper headsets out there that offer solid mics, better audio a great build, and more features. Few might have comparable noise-cancelling performance, but unless you’re gaming in loud arenas often, the feature doesn’t justify the price tag. If you have the money to spend on the Victrix Pro AF ANC, think about the SteelSeries Arctis Pro or Beyerdynamic Custom Game instead.